I use POVRay for all my renders (megaPOV actually, a patch of POV,for HDR support). While Moray can help withe the modelling, I generally wouldn’t find it of much use for lighting and texturing, which these challenges focus on: lighting primarily, with texture due to it’s interaction with the scene lighting, while the modelling already (mostly) completed. But once you get to understand how to use POV, it can be very good at getting the lighting and texturing you want, but it can take time (I’ve been using it for ~12 years now and still learning what I can do and how). Yea, the program has a ton of features that you can adjust, and the render quality is definitely nice to play with. Is the HDR support good on it, haven’t tried it yet? I’ve used the radiosity within the program, which actually does pretty well without having to modify too many options. I haven’t used it in so long, probably forgot how the code is set up. I worked in Pov-Ray for about 3 years before I went to school and learned Maya. Hi all, congratulations on some great images! I thought I would chime in with my first semi-completed lighting challenge. There’s still some work to do, especially on the flames and candleholders. I also can’t seem to get the grain out of my SSS shader despite cracking up the samples to 250 and setting the lightmap size to 800x800. Enough of my complaints, enjoy the image. I look forward to your comments! ´@Jeremy : thx for your coments, which I tried to translate into this revised version of my scene. Worked some more on my textures. Also now using ambient occlusion instead of GI (1/4 the time and no noticeable reduction in quality). This took about 25 min to render. Actually this is pretty weird … I’m very new to Maya but I’ve been working with 3dsmax for 2 years - But allmost everything I could do in Max in a few minutes takes in Maya the double amount of time. This rendering rendered 16 (!!!) Minutes, what did I do wrong? 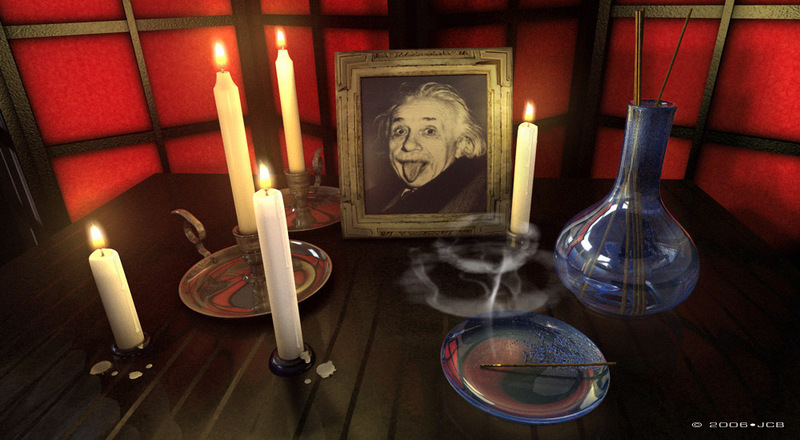 The scene has 5 Point Lights over the candles with an intensy of 10, a linear decay and raytraced shadows with a light radius of 10, 30 shadow rays and a rey depth limit of 2. Is it because of those 30 samples? Materials are coming up next ;). edit: ok, it was the shadow rays ;). @jucaduarte - Thanks for your good comment ! @lazzhar - Great picture, cool ambiance and light color, well done ! is quick, we can see the blue-orange gradient of the flame and its transparency. You can see Jeremy’s photographs on page 3. That’s beautiful! If there’s an area that could be improved, it’s the “readability” of the image (by how well things “read”, I mean how well they stand out with enough contrast to be well defined) For example, the top of the vase is just the same tone as the screen behind it, so they almost meld together. A little kick of light there, or making the background a little darker, would help alot. It’s a similar issue with how the middle candle overlaps with the candles behind it, sliding the camera to the side a bit would visually separate them. I like the ornamental textures you have on things. The use of occlusion is a bit heavy, but somehow it works well for this scene – even if it’s not realistic, the softness adds to the feel of the image. The only surface that’s a bit distracting is the plate, it seems to be reflecting an unmotivated bright yellow light. If you want to do the “recursive” render like this without the photoshop work, you could set it up so that the texture mapped into the picture frame is the previous animation frame to the one being rendered, then render it as an animated sequence. You’ll need to give it an old image as frame zero to start off, but then each frame will go one level deeper into the recursion, and by the time it runs overnight it’ll be far enough to resemble an infinite tunnel of images within images, and it’ll even appear correctly in reflections. @Littleluk - Good start so far. Try test-rendering just 1 candle at a time to really get the glow around the flame and the pool of light around it perfect. @lazzhar - My god! That demon-child is going to give me nightmares! Lighting looks good. I think the candle light could be warmer, or at least less grenn in places. And maybe the lighting on the vase could be swapped left-right so the brighter rim shows up on the other side? @HowieFarkes - That’s a great scene, really solid work. If there were tweaks, I might try a slightly lighter black in the black wood on the background screen, and slightly tone down the reflective metal candle holders. @vtcgman - Great. I agree the candle holders could be toned down. Maybe the vase could be better defined as well? @neuromancer1978 - That looks good, definately needs some balancing of the tones though. I don’t know what that “beard” of darkness near the top of some of the candles is? @JCBug - Great scene! The wax is OK, although it looks like a different color than the candles. I really like the creative smoke there. I’m confused about the vase, it looks cool but I can’t tell if it’s supposed to be transparent or just a reflective black material or what? @Wilhelm - Nice! The subtle work on the flames and the smoke is great. The pictures are so dark, and the reflections so bright, that it almost looks like pictures of candles. Hope that can be fixed. Maybe the specular highlights on the candle holders could be toned down a lot also? @Couch - That’s a great image, with the ghostbusters green look! I agree the edges of the candles, especially the bottom edge, could be toned down, although if you do that you’ll need to check that they still read well and have enough contrast against the background. Yeah I have no clue why the candle’s translucency is giving that effect, it has been bugging me for days now. I wouldn’t have any idea how to get rid of it either, so I might just have to change camera angles so it’s out of picture. As for the tones, yeah needs work. I saved another render in hdr format so I can mess with it, but I think I might need to rework my lighting again. smoke and flame from tutorials of Deconstructing The Elements with 3ds Max by Pete Draper. this book is great, 5 star from me. Good question, Littleluk! Thanks to padawan for answering, and to the others who’ve posted some how-to info. I’d love to hear more people’s answers: How did you light your scene? What software and techniques did you use? Did you have any problems or issues? Got a tip or a screenshot showing how you did it? Was there anything you learned while doing this challenge? This thread is already doing great in terms of high quality renders, I hope more people who’ve already posted images can post some info! Jeremy, thanks for your comments. You have lynx eyes ! I’ve corrected the wax color and the transparent vase. highlight yellow 200% + point light in the flame 30% yellow. HDRI sphere 30%, GI 20%, AO 50%. Rendered in 2 hours on a Mac G5 dualpro 2x2,5 Ghz. @ i.dyoel: Really nice work man! The colors are working very well and great mood! I do agree about posting breakdowns of our images. I am sure every one of us has a unique way of how we went about creating these. Now if I could just finish mine. Hi… Here is my first reply. Thanks a lot for this challenge. I like it ! There are many nice works. Bravo to everyone !! @thunders - Welcome! That’s great! Very bland 1950’s look. The subtle reflections, the definition of the vase with rim light, the ash at the end of the incense, all those little things add up to a really solid image. I like the composition overall, although the center candle would read better if it didn’t form a tangency lining up with the candle behind it, maybe I’d move one of those a little. @JCBug - Your candles are working well! Regarding the title of the image, Albert Einstein didn’t invent (or work on) the atomic bomb, but I guess that’s not important to this thread. Most of the scene is great, but that background needs work: Maybe a little more diffuse (so it doesn’t go all the way black in places), less specular, a more natural and subtle bump texture, and a lot less occlusion on the screen? I can’t figure out what the blue things on the plate are: it looks like blue crayon-shavings floating a little bit above the surface? 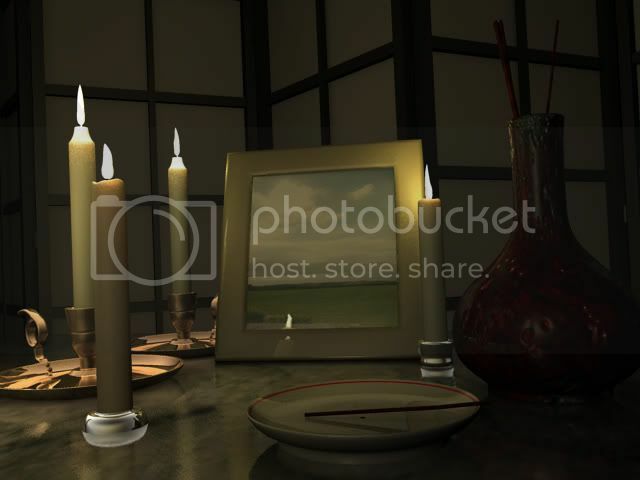 The vase looks good, I’m sorry I didn’t model the interior fully but you made it look nice anyway. @i.dyoel - That’s looking good. Most of the flames look nice, except the lower one that looks too much like a solid object. It would be great if you could make the lower part of the back two candles brighter, and get rid of the white reflection on the picture frame. he instigates the Manhattan project. (with the E=MC2 Einstein formula), Joliot-Curie, Alban and Kowarsk. But who knows their face ? with the mushroom smoke, it’s an allegory easy to understand.